Numbers can be reduced prior to the Final Payment One Month Before. However if number falls below the 50% initial deposit amount the difference will not be refunded. Furthermore construction noise on the premises will be unavoidable between the hours of 8am and 7pm Monday to Friday and we will not have lift 7or disabled access at the property during this time. We have special offers in place for booking stays during this time. 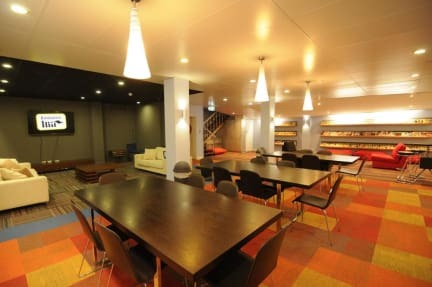 The 4-bed dorm rooms (mixed and ladies only) are the rooms most affected by the noise and thus have the best discounts. Welcome and Thanks For Checking Out Kangaroo Inn – Perth’s Best and Most Awarded Premium Backpackers. We are the only Backpackers to have won multiple awards in the WA Tourism Awards with Silver in 2016, Gold in 2015 and Silver in 2014! We are definitely not a party hostel but that doesn’t mean you can’t have fun during your stay here. We are close by to all of Perth’s major attractions such as the Swan River, Perth Mint, Kings Park, Art Gallery, Perth Arena, WACA and the Murray St and Hay St Malls. Public transport is also nearby whether Ferry, Bus or Train. Plus, although we are only a 10 minutes walk from the Northbridge entertainment precinct we are far enough from the noise if you want to get a good nights sleep. Which brings us to the rooms, regardless if you choose our comfortable private rooms or budget dorm rooms you will get a good nights sleep with our 4 star hotel grade mattresses and soft cotton sheets. Private rooms (except for twin bunk rooms) get the added bonus of TVs and in room safes. All rooms are well-appointed and include reverse-cycle air conditioning with in-room controls and ample power points to charge your devices. Linen and towels are also provided. Guests share bathroom facilities; there are dedicated mens' and ladies’ bathrooms on each floor, fitted out with luxury fixtures. 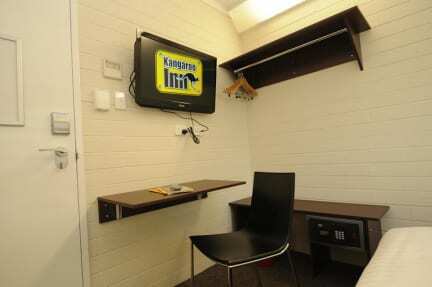 Kangaroo Inn has multiple common facilities including a massive basement common room, commercial kitchen, outdoor deck, a reading room, lobby/computer areas and guest laundry. Of course WiFi is available throughout the premises. Very nice hostel to sleep in. Otherwise wasn’t there much! Mostly was out doing tours! Absolutely loved this place! The staff and people were great and the location is unbeatable! A quiet hostel in a great location. You are right in the centre of town with the train station and free bus lines just around the corner. Staff are friendly and helpful and facilities and dorms are clean and fit for purpose. There are lots of live in Tennants so not a huge amount of atmosphere as most of them are working. Overall would recommend though as a great base from which to explore Perth. Two person room, nice and spacious. Didn't really use any of the facilities like the kitchen etc. Noisy corridor though as the doors slam a lot at all sorts of hours as there were a lot of people staying there for work. Good location for CBD, Elizabeth Quay, bars/clubs. Easy to get to from the airport. Nice staff but super weird atmosphere. No activities to get people involved. People checked in at 2am and talked loudly. Good location and cheap but wouldn’t stay here again. The pictures are definitely a catfish. Although there was a large lounge and well equipped kitchen downstairs, the rooms were tiny! We could barely move in our room and there was 5 men and 1 woman in our room which made the woman I was travelling with feel uncomfortable. The hostel didn't have a friendly feel to it and there was definitely more long term stayers than backpackers/travellers; however the beds were very comfy and the hostel was generally clean. Do NOT stay here if you have to check in after hours!! I emailed that I was arriving late and had to call 4 times at 1a.m standing alone on the sidewalk, watched by 3 homeless men. Then I had prepaid for a deluxe 4 bed female dorm (I’ve never had to prepay for a nonrefundable room before) and they put me in a room with 1 set of bunk beds and I walked in on an old man clipping his toenails at 1:30am. After calling the night manager again, I still wasn’t given the room I paid for. Won’t go back.